I wrote this article for “The Griffin,” which is Chestnut Hill College’s student-run newspaper. Text is to the right. Chestnut Hill College hosted a juvenile law lecture headed by a renowned expert and advocate for children’s and women’s rights open to all students, staff, faculty, and the public on Nov. 3 in order to spread awareness about juvenile injustices. The lecture, which was planned by Sara Kitchen, J.D., a professor in the criminal justice department, had a great turnout and left individuals informed about and maybe even determined to join the fight against juvenile injustice. The speaker is also deputy director and chief counsel of Philadelphia’s nonprofit Juvenile Law Center and an adjunct faculty member at the University of Pennsylvania Law School and Temple University Beasley School of Law. Marsha Levick informed her audience, mostly criminal justice majors, minors, human services students, and criminal justice staff, about her work in the Luzerne County, Pa. 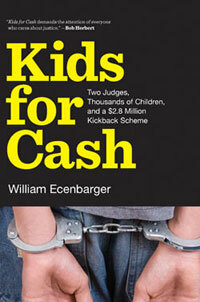 Kids for Cash kickback scandal involving two elected judges who essentially jailed kids for cash, a case which CHC students in the juvenile justice course are dissecting in depth. 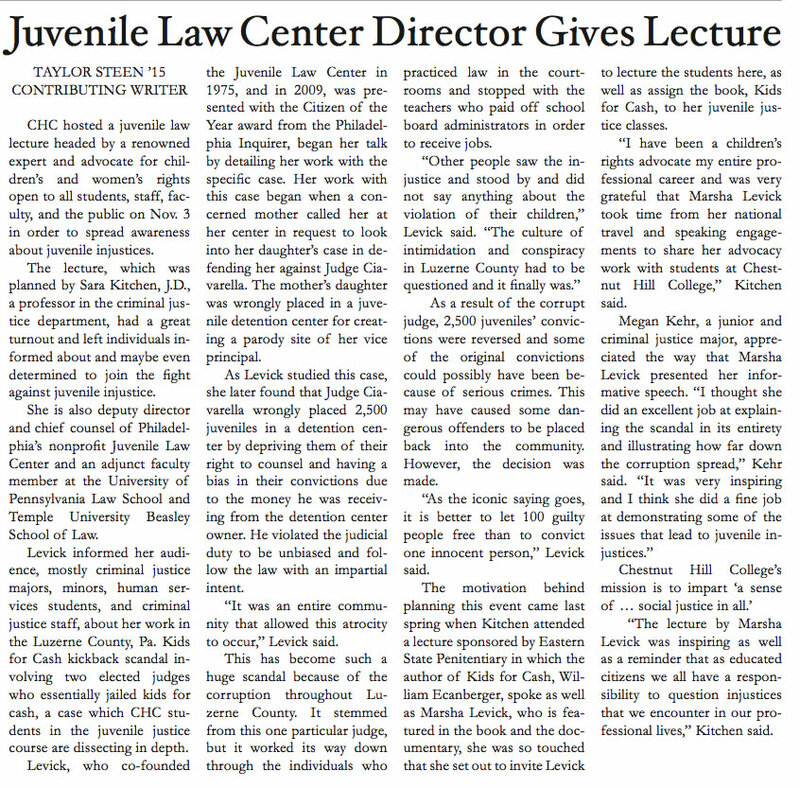 Levick, who co-founded the Juvenile Law Center in 1975, and in 2009, was presented with the Citizen of the Year award from the Philadelphia Inquirer, began her talk by detailing her work with the specific case. Her work with this case began when a concerned mother called her at her center in request to look into her daughter’s case in defending her against Judge Ciavarella. The mother’s daughter was wrongly placed in a juvenile detention center for creating a parody site of her vice principal. As Levick studied this case, she later found that Judge Ciavarella wrongly placed 2,500 juveniles in a detention center by depriving them of their right to counsel and having a bias in their convictions due to the money he was receiving from the detention center owner. He violated the judicial duty to be unbiased and follow the law with an impartial intent. “It was an entire community that allowed this atrocity to occur,” Levick said. This has become such a huge scandal because of the corruption throughout Luzerne County. It stemmed from this one particular judge, but it worked its way down through the individuals who practiced law in the courtrooms and stopped with the teachers who paid off school board administrators in order to receive jobs. 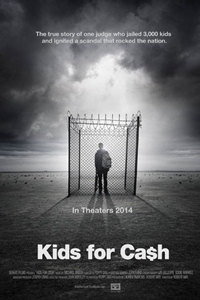 As a result of the corrupt judge, 2,500 juveniles’ convictions were reversed and some of the original convictions could possibly have been because of serious crimes. This may have caused some dangerous offenders to be placed back into the community. However, the decision was made. “As the iconic saying goes, it is better to let 100 guilty people free than to convict one innocent person,” Levick said. The motivation behind planning this event came last spring when Kitchen attended a lecture sponsored by Eastern State Penitentiary in which the author of Kids for Cash, William Ecanberger, spoke as well as Marsha Levick, who is featured in the book and the documentary, she was so touched that she set out to invite Levick to lecture the students here, as well as assign the book, Kids for Cash, to her juvenile justice classes. “I have been a children’s rights advocate my entire professional career and was very grateful that Marsha Levick took time from her national travel and speaking engagements to share her advocacy work with students at Chestnut Hill College,” Kitchen said. “The lecture by Marsha Levick was inspiring as well as a reminder that as educated citizens we all have a responsibility to question injustices that we encounter in our professional lives,” Kitchen said.